11/15/2018 6:00 AM by Jacob C.
Richmond, in 2016, was #2 in the rankings of highest evictions in a large city. That equates to 5,803 eviction notices to renter households in Richmond in 2016 or 1 in 9 renter households. A result of the affordable housing crisis that many cities are facing is eviction. Several universities around the country are studying eviction, affordable housing, and its effect on communities and those trying to get ahead. Our local university, VCU, has now taken up the mantle and is looking to get to the root cause behind evictions. The why and the how. You can read more at here. I think this has been discussed (inconclusively?) in the comments for previous articles, but: do we have any idea what these researchers are considering to be an “eviction.” This could be a) the initial five-day pay or quit notice b) the filing of an unlawful detainer suit c) when a tenant loses an unlawful detainer suit or d) when the sheriff’s office executes a writ of possession. A, B, and C are all preliminary steps and don’t always result in a tenant being forced to leave. If these researchers are counting notice to pay or quit, then they are overlooking people that pay. If they are counting unlawful detainer suits filed or unlawful detainer suits that tenants lose, they are potentially undercounting tenants that pack up and leave the moment they receive a pay or quit, but researchers could also be overcounting because of Landlords that make alternate arrangements (payment in lieu of actual eviction, etc.) after winning an unlawful detainer trial/suit. Would be curious to know more about their methodology. Free enterprise is generally what responds to any market “crisis.” (Remember the gas crisis?) Population is growing, as it inevitably does. More people are choosing to live in cities than in the recent past. But the laws of supply and demand will resolve any “crisis” which people perceive (or which may actually exist). My only fear is that government steps in to try and fix things. This always makes matters worse, but we never seem to learn this. Unfortunately, the VCU team is planning to produce a report outlining the scope of the problem as well as “different policy and the best practices toward eviction prevention and reduction . . . .” Smells like government solutions are baking in VCU’s ovens. 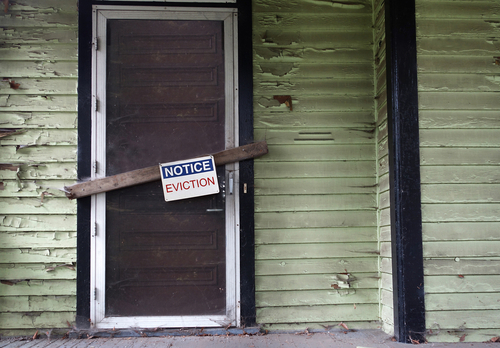 eviction is often a result of not paying rent, and no money is a sign of poverty. good to see the academics are putting that together. I am glad to see VCU getting involved in this. Matthew Desmond’s book Evicted (Pulitzer and a New York Times “Best Book” award 2016) is a powerful read on this. I personally know a family that was evicted while the person on the lease was hospitalized from a stroke. Housing instability is a major, multi-layered problem in our city. I think I am missing something. I don’t the premise in any of this. What is this housing crises you speak of? I don’t see a crises in affordable housing. What I see is people not having the discipline to get an education, advance their skill set, and balance their income/expenses to afford the housing that they want verses the housing they can afford. Not everyone can afford their own place and need to stop living as if they can, then filling it all up with rented furniture pretending as if they are some big shot. As far as the eviction numbers is concerned, seems to me that the contract laws are still of some use. When the terms of the contract are violated, one does not get to keep the product. At times it is not even just the money, its eviction for vandalism, police calls to the house, too many residents, etc. Things are so slanted in favor of residents under the law and they still are getting evicted; that is saying something. Considering that I keep seeing articles about how so many people can’t come up with $500 I am not surprised but I am not going to sacrifice rental income for their bad decisions. #2 It’s nice that you are so certain that government ALWAYS makes matters worse. I’m sure you’ve arrived at this conclusion after studying the matter. I don’t think you realize that government is involved no matter what. You just don’t acknowledge it when it works in your favor. You can’t sell a house without the government being involved (title). #1 data collection methods for the original eviction lab can be found on the evictionlab.org and I’m sure VCU is going to operate in a similar fashion. #3 it’s far more complicated than that and our rank as #2 should be concerning. I have no doubt the research will have some inaccuracies but if you read the articles you can see it has enough significance to warrant a closer look. We need to be asking questions for why it would seem like we have more evictions than Detroit. Perhaps how our records are processed is inflating our numbers? Are court records just more accessible here as opposed to other cites? Is Richmond more efficient at processing eviction cases? Is there an exorbitant amount of unethical leasing going on? How does weather and natural disaster impact eviction? How does cost of living impact eviction in Richmond? Are there schools or community programs in other cities teaching money management that we should incorporate here? Why is economic stability and mobility so low in Richmond? Do other cities allow longer grace periods for people to get rent in? How many of those evicted had devastating medical bills? How many of those evicted had mental health issues or disabilities? Richmond is notorious for denying disability benefits, I have no doubt that impacts evictions. #5 I always see people blaming poor people for everything on this website and I’m real tired of the pick yourself up by your boots strap mentality. I hope you all realize that socioeconomic mobility is extremely low in our country. You’re likely to remain in the same socioeconomic class you were born in or go lower. It’s pretty rare to move up. Also the majority of those under the poverty line are children. Children who do not have access to resources or opportunities to get out of poverty who later become impoverished adults. And it’s not just people lavishing living outside their means, good hardworking people get evicted too. I work at MCV and have seen over and over how one accident, one fall, one ER visit ends up bankrupting someone. Its not uncommon for someone to lose their housing before their discharged. What’s their options there? If they didn’t come in they’d be dead. Bad stuff happens to good people all the time and maybe we should invest in more safety nets so they don’t end up on the streets. -the 2007-08 financial crisis (brought to us courtesy of Federal Reserve loose money policies together with Congress’s Community Reinvestment Act —passed to aid everyone in owning their own home). And, by the way, title to my home is not courtesy of the government, nor is a recording office really necessary (even though it is helpful). Without such a government office, private persons would manage title issues, mostly via title insurance, which already exists. @ Grace/7 – thank you for the link. I read through the methodology section, and it appears that they are counting any award of possession to the Landlord as an eviction. In Virginia, it is my understanding that doesn’t automatically result in an eviction – a Landlord may subsequently negotiate with an evicted Tenant. I think the distinction is that in other states this is usually a court mediated process, whereas here it is entirely outside of the court system. I have no idea how common this sort of negotiation is. As a Landlord I have made post eviction rental arrangements with a tenant myself, which may skew my perspective. Anyway, an “eviction” in the sense of forcible removal only happens when a Landlord purchases a writ of possession. However, “writ of possessions issued” wouldn’t be the best standard either, as many evicted tenants leave before the court date, and there is no need for the Landlord to bother with purchasing a writ of possession. 1) Grace periods: If you’re referring to the number of days a Tenant can pay late, this varies by rental contract. If you are referring to the number of days a Tenant has to pay after receiving a nonpayment notice or to vacate after a lease termination – this should not vary by city, as these timeframes are set by law. 2) Unethical leasing – I suspect this is a serious problem. We own some small apartment buildings that we bought through foreclosure/pre-foreclosure. They were all being managed by a large, well known local property management company that I am reluctant to name for legal reasons. The management firm appeared to have been appointed by the bank, as the owner was in arrears on the mortgage, but I admittedly do not understand the legalities. Anyway, we discovered, upon receiving the leases for the buildings, that the management company had been leasing to tenants with credit histories and incomes that suggested it was unlikely they would be able to pay rent. The managment firm would charge the largest deposit legally allowed, take large “management fees” ($500, if I remember correctly) out of the deposit and out of the first months rent, then evict the tenants as soon as they were late on rent and immediately rent the apartment to someone else that was equally unqualified. It looked like they were cheating everyone (tenant, neighborhood, bank, and property owner) as the managment firm’s fee structure and leasing practices cut into rental income to maintain the building and pay the mortgage. I have no idea how common this sort of thing is, but again, this was a LARGE property management company. @Grace: You might want to read up on social mobility. “Most working Americans who were initially in the bottom 20 percent of income-earners, rise out of that bottom 20 percent. More of them end up in the top 20 percent than remain in the bottom 20 percent. I didn’t see a single citation or research study in that article you’re referencing. Without such a citation that article reads as opinion and in my mind does nothing to contradict what is being discussed here. In addition, the author references “gangster rap” as a reason for individuals not taking the opportunities available to them. He makes a very weak argument. if poverty is not a desired condition, are you saying poor people should not have children? @Bill Im not saying that all. I’m saying local governments need to make better efforts to help people not live in poverty and make sure children have at the minimum basic financial security. The strategies they currently have inplace are insufficient.